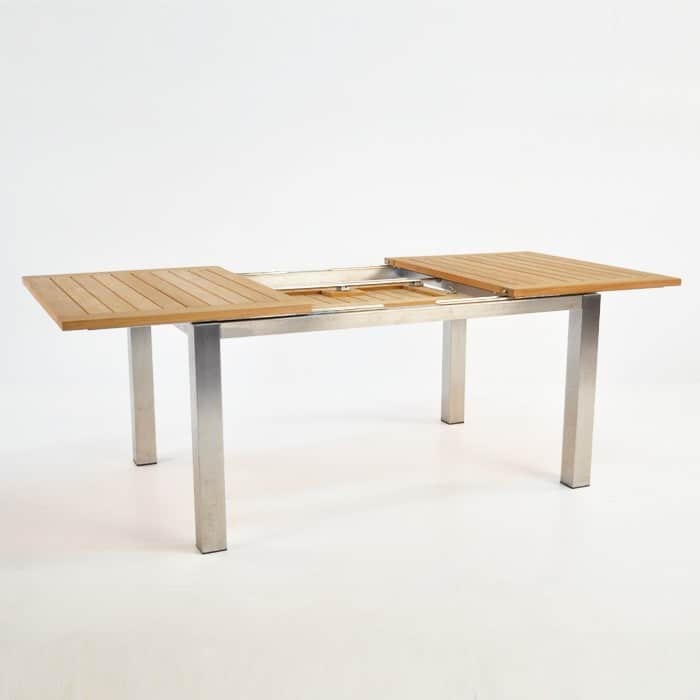 Expand your social circle with this expanding Stainless Steel and Teak Extension Table! Overtly stylish, the Stainless Steel and Teak Extension Table has a solid #316 stainless steel frame and a sleek teak table top featuring tidily, tightly fitted horizontal slats with an unfolding leaf enabling the table to extend from 58 to 86, as well as options in other sizes! 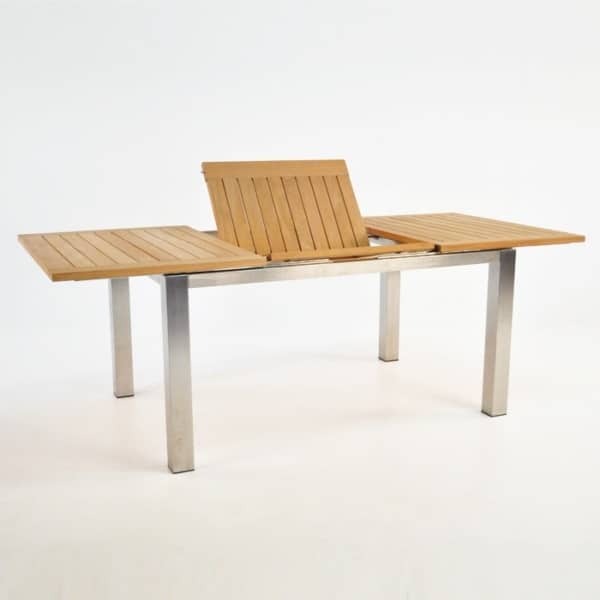 Part of our lavish teak, Batyline® and stainless steel collection, the Stainless Steel and Teak Extension Table has proven to be one of our best sellers because of its versatility, strength whilst still being an incredibly chic, fashion forward piece of luxury outdoor furniture. L58" > L86" x W39" x H29"
Also in the collection is a range of dining and relaxing chairs, loungers and side tables. Peruse our website or call our store to discover more items in this exciting collection. As well as these beautiful pieces, we also carry a range of spectacular raw concrete products – choose from tables, benches, accent tables, stools and planters. 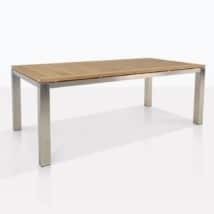 Why not try the Stainless Steel and Teak Extension Table with a concrete bench for a supremely modern setting? After shade? Teak Warehouse carries an excellent range of umbrellas and cantilevers to suit any outdoor area. Choose from elegant classic colors: taupe, black, gray and canvas to compliment your area. If you’re interested in all weather wicker, we have done our research and have garnered the best quality deep seating, dining chairs, lounge chairs and sunbeds. All through-dyed, polyethylene synthetic fabrics that have been UV treated so they will not discolor or morph in the harsh sunlight – ensuring you will enjoy them for years to come! 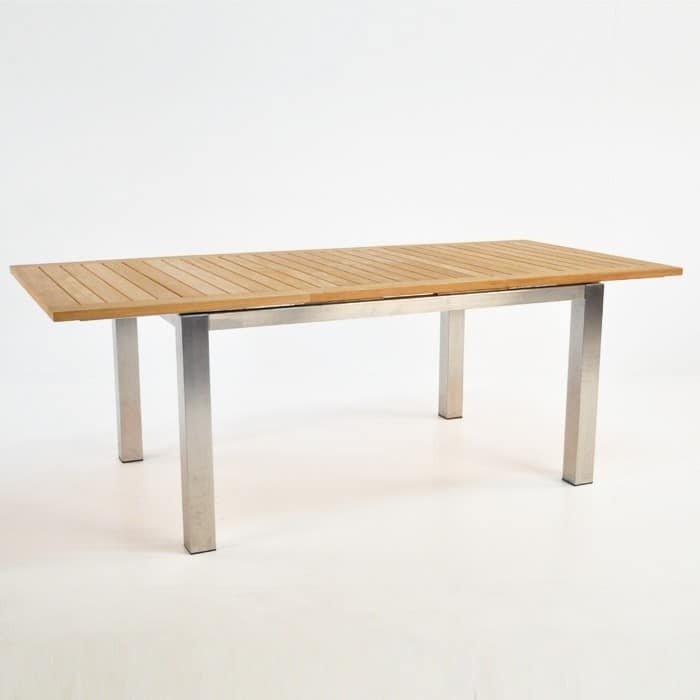 The Stainless Steel and Teak Extension Table is made of #316 Stainless Steel – a marine grade product which won’t rust or pit being outdoors. It’s table top is made of A-Grade Teak, another marine worthy product, considered the best wood product for constructing outdoor furniture. The reason being is that it holds extra ordinate amounts of strengthening oil and rubber content, giving it the gorgeous look and the long life factor! 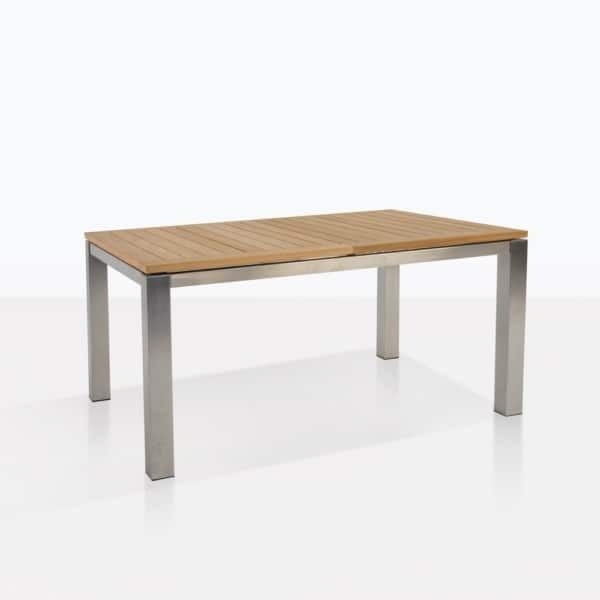 The Stainless Steel and Teak Extension Table can be placed with a matching A-Grade Teak and Stainless Steel dining chair for a sleek, pleasing look. Soften the area with a few concrete planter boxes filled with small leafy trees, or texture the table with some of our beautiful resin lamps and votives. Perhaps your space overlooks an ocean view? You want to create something long and lean. Purchase the Stainless Steel and Teak Extension Table with a matching bench that sits perfectly between the table legs and add airy Batyline® white mesh stacking chairs for a flowing, elegant look to enjoy those awe-inspiring sunsets. These tables are ideal for people who like to dine outdoors as a couple or a family but are also perfect for a larger party! 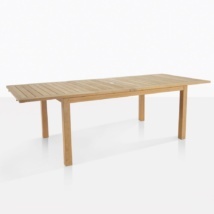 These outdoor dining tables (which extend) come in three sizes. Each have hidden extension leaf slides which hide under the table when the smaller size is needed. Our Stainless Steel and Teak Extension Table is the ideal piece to upgrade your space. Make it the central focus and piece de resistance in your outdoor area.